Scottish Rugby is re-issuing the Scotland cap of Olympic hero, Christian missionary and former rugby union international player Eric Liddell, which was lost over the decades. Eric’s daughter, Patricia Russell, is travelling almost 5,000 miles from her home in Canada to Edinburgh to accept the unique cap in her father’s honour at the Eric Liddell Centre’s inaugural Going for Gold Fundraising Gala next month. The gala is taking place on Tuesday 5 December at the Sheraton Grand Hotel in Edinburgh in a bid to raise funds for the centre, which specialises in care for the elderly and dementia services with the aim of supporting people to remain in their own homes for as long as possible. Eric Liddell – whose story was told in the classic film Chariots of Fire – won seven caps for Scotland between 1922 and 1923. His first cap was won against France at the same Colombes stadium in Paris, in which, two years later, he would race to Olympic gold. When news of the cap being lost reached Scottish Rugby, they decided to replicate a special one-off copy and return the prestigious honour to Liddell’s family. The gift received the blessing of the current Scotland management, led by head coach, Gregor Townsend, who, like Liddell, studied at Edinburgh University. 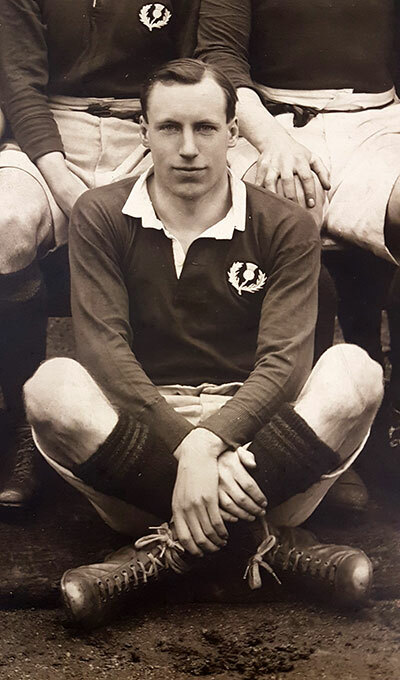 Ian Rankin, a past president of Scottish Rugby and chairman of its own charity, the Murrayfield Injured Players Foundation, said: “Eric Liddell is part of our rugby family and his achievements on both rugby field and athletics track were truly inspiring. “There is huge symbolism around a cap. It means as much today as it did 95 years ago when Eric made his first appearance for Scotland. John MacMillan, CEO at the Eric Liddell Centre, added: “We are thrilled to be welcoming Eric Liddell’s daughter Patricia to the gala to accept the special cap, gifted by Scottish Rugby. Eric was an outstanding rugby player, and international athlete, so we are delighted to see his cap return to his family. Scottish Rugby’s points-record holder Chris Paterson MBE and award-winning author Alexander McCall Smith will also be appearing at the gala, while comedian and columnist Susan Morrison will be compering and hosting the live auction. The Murrayfield Injured Players Foundation focusses on providing support and assistance to injured Scottish rugby players but is financially and administratively independent. Since its inception the Charity has assisted a number of players with long term injuries. The full list of auction items can be found at www.goingforgold.ericliddell.org and click here for details of how to purchase tickets to the gala.